Pluck neem flowers from the stems. Pluck fully bloomed flowers otherwise they taste more bitter. Pluck all flowers and keep them aside. Take a tender mango and wash it. Unlike fully grown raw mango, a tender raw mango has a peculiar flavor. So use a fully grown raw mango only and only in case you do not get a tender raw mango. Peel the mango and cut it vertically. Remove the inner portion of the mango (JEEDI) and cut it into fine pieces. The vegetable you eat should also look nice to eat—it tastes good which looks nice to eat. Soak tamarind in water till soft. Squeeze out pulp from the soaked tamarind—or else put the soaked tamarind in a mixie jar and run it to get a smooth pulp. Take only smooth pulp and discard the residue. Grate or powder the jaggery. Similarly wash and finely chop the green chili. Here we are chopping all the ingredients finely—this is because—they get mixed well soon, they look good in appearance and also they taste better to eat. Take tamarind pulp in a bowl and add finely chopped green chilies, neem flowers, grated jaggery, finely chopped mango and salt. Mix all well till the jaggery is melted. 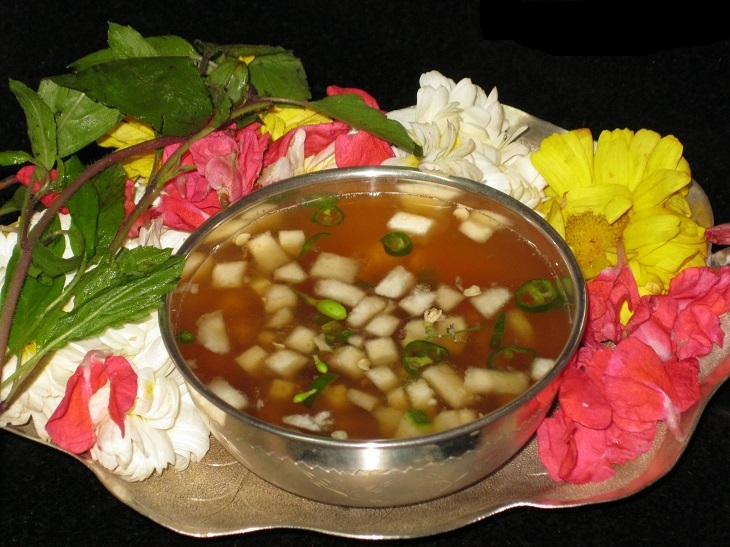 This pachhadi tastes excellent so in case you wish to make in large quantities just multiply the ingredients shown.Serve this tasty pachhadi to all your family members early in the morning and welcome the TELUGU NEW YEAR. Enjoy the six flavors of this unique pachhadi which indicates that life is considered to be balanced only when it is a mixture of joy, sorrow, happiness, sad moments, anger and tranquility.